I’m looking for an 8 inch seated Polar Puff 24k 1992 No. 4089 Green frog the manufacturer named Riley. The tag reads 24K Polar Puff Special Effects 1992 DCN Industries INC. He has a pink thread mouth. He is a stuffed animal from when I was a child. At some point, I barfed, and he caught most of it, because he is very helpful and doesn’t like a mess. Ideally, I want to find another one, so my future children can have such a helpful playmate. I am also curious about where he came from. 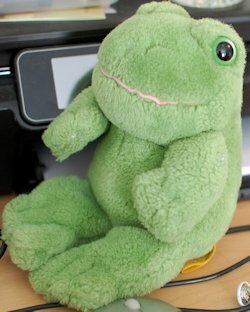 A Google search is bringing up other stuffed animals, but not the frog that helped me all those years ago.